Agricultural Economics & Agricultural Extension PGD, M.Sc. & Ph.D. Animal Science PGD, M.Sc. & Ph.D.
Art History M.A. & Ph.D. Studio Art: (i) Ceramics ii) Graphics (iii) Sculpture (iv) Painting & Textiles Ph.D.
Music PGDM; M.A. & Ph.D.
(iii) Church History (iv) ATR (v) Christian Theology M.A. & Ph.D. Languages & Linguistics: i) French Languages & Linguistics ii) Lit. in French iii) Translation M.A. Educational Administration & Policy Studies M.Ed. & Ph.D. Guidance & Counseling / Measurement & Evaluation. M.Ed. & Ph.D.
Science Education (i) Biology (ii) Chemistry (iii) Mathematics M.Ed. Vocational Education: (i) Agricultural Education (ii) Home Economics M.Ed. & Ph.D.
(ii) Sports Management/Health Education M.Ed. & Ph.D.
Accounting/Banking & Finance PGDBF & M.Sc. (iv) Physical Chemistry (v) Industrial Chemistry M.Sc. & Ph.D.
Physics: (i) Geophysics (i) Solid State Physics (iii) Radiation & Health Physics (iv) Theoretical Physics M.Sc. & Ph.D.
Microbiology: (i) Environmental Microbiology (ii) Food and Industrial Microbiology. M.Sc. Geography and Regional Planning M.Sc. & Ph.D. Political Science M.Sc. & Ph.D. List of applicants offered provisional admission into any of the DELSU Postgraduate Programme will be published in the Postgraduate School at Abraka Campus. Screening of provisionally admitted candidates and payment of fees will commence immediately thereafter and end on Monday, September 30, 2019. 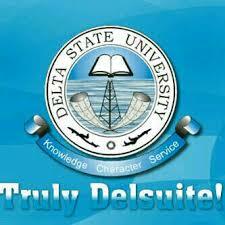 The Closing date for the sale of Delta State University, Abraka, DELSU Postgraduate forms is July 31, 2019. Please share this online using one of our social media buttons, you can find them below, immediately after this post. I can`t generate a pin for the bank payment, don`t know if i have to travel down to Abraka before i will be able to do so, if there`s anything I can do from this end I am very much interested in being in the know as am currently in Portharcourt. Is the form for post graduates programs for Abraka for 2017/2018 out how much. What is the cost. When is the expected ring date. The cutoff mark for DELSU last year was 180 and above. So yes, you are eligible to apply for the admission screening. I have done change of institutions from uniben to delsu so what nest, I scored 215 in my jamb will I be admitted to read medicine and surgery? please is pgd form still on sales? Yes. The form for 2018/19 session is still on sale. Guys, I wish to take a form for Msc Economics but had my first degree in Management studies. Delsu does not have a PGD in economics. Does anyone knows about any Pre-M.sc programme in Economics programme or can anyone provide details of whoever can help out? Pls am just inform that application for post graduate form is closed is there going to be extension for the sales of the form? We don’t know if there is going to be an extension yet. I want to purchase the post graduate form to do an M.SC in economics (MEPE).pls can I still purchase it at this time or its too late to do so. Can I be offered admission for the PhD programme with MBA obtained before 2003.